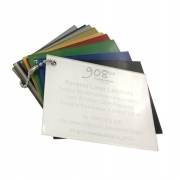 Reverse Engraving Laminate is suitable for rotary engraving and laser engraving/cutting. This product features in our sample starter pack. It is made from laminated modified acrylic sheet. This product is UV stable and very durable, making it suitable for all kinds of interior and exterior applications. 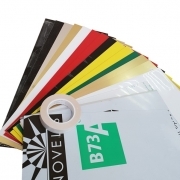 This exciting material has a clear surface and a coloured base. It allows for reverse engraving, through the coloured layer. You then have an option, to add different colours to your engraving. Using the infill technique. We recommend the use of coloured water based paints. Alternatively this material can be used with back lighting. Method of application for our Acrylic Paint Fillers.